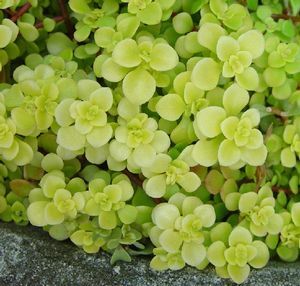 An unusual Japanese selection, preferring some afternoon shade and moderate moisture, the creeping golden-yellow foliage is tight to the ground at 2” and offers bright contrast in the rock garden or pathway. Teeny tiny yellow-green flowers in mid-summer blend into the foliage almost unseen. Semi-evergreen for southern gardens, use in containers or as an annual north of zone 7.